The promise of a dream job lures Murphy to Tampa, but he arrives to the rude awakening that the offer is on hold. Now he’s got two choices: slink back to Michigan with his tail between his legs or stay and look for work. Things perk up when he goes into a coffee shop and learns the owner is looking for someone to renovate the apartment above it. He happily takes the job, only later realizing he’s met Joe Sterling, Kaffeinate’s proprietor, before… when they hooked up at a club Murphy’s first night in Tampa. Murphy and Joe are both proud, passionate, and outspoken. Neither is looking for a relationship, though they can’t deny they go together as well as coffee and doughnuts, in spite of their tempers. But that’s before Joe learns Murphy will be working for the corporation he believes is harming local businesses and the environment—and if Murphy will be supporting it, Joe wants nothing to do with him, dooming any possibility of an unexpected happy ending. I love pretty much anything S.J.D. Peterson writes, and this was no exception. I love that her characters don't always make the right choices and they don't always do things perfectly. They are human and make mistakes and it makes the story so captivating. I listened to the audiobook version of this and the loss of the star comes from that more so than the actual story. At the beginning of the book, I really just had a hard time with the narrator and distinguishing between the main characters. There was also background noise that was quite distracting at times. Other than that, I love that we got a sweet romance even if it was a bit fast-paced for me. It kind of seemed like the relationship went from just two men sleeping together because they can't keep their hands to themselves to someone issuing the L word, and I didn't feel like their relationship had really gotten to that point since it seemed like more than 90% of their time together was between the sheets and we didn't see much evolving in the relationship they had. The plotline was definitely interesting and not expected from how the story started. SJD PETERSON, better known as Jo, is a bestselling and award-winning author of gay romance. She lives in Michigan with her Itty Bitty Kitty and Little Man. She does her best writing when under pressure of deadlines and at 3:00 a.m. when the world is quiet. Jo loves to tell stories about real people with real flaws. The happily ever after isn’t guaranteed unless it’s earned through hard work and growth. Oh, but when it comes, the rewards are all the better! I am a character voice actor who has had four years of amateur and professional experience. I've worked on independent video games, animated shorts and radio dramas. With a focus on characterization, my goal is to breathe life into the players of your stories. 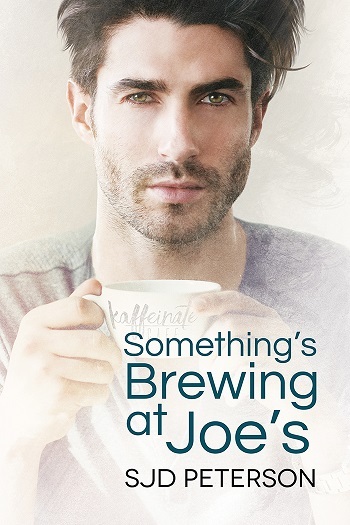 Reviewers on the Wicked Reads Review Team were provided a free copy of Something's Brewing at Joe's by SJD Peterson, narrated by Chase Johnson to listen to and review.